So you’ve decided to purchase an upright piano- congratulations! Now, you must make the decision between buying an upright digital piano or an upright acoustic piano. Each of these types of pianos have their benefits and drawbacks. Upright pianos are so named because they stand upright. One of the main benefits of an upright piano is its size. They are available in various models with shorter ones (around 43 inches high) called consoles or spinets, and larger ones (which can be from 48 to 60 inches in height) thought of as traditional upright pianos. Despite its smaller size, upright acoustic pianos are usually quite heavy, weighing anywhere from 300 to 1000 lbs. Digital upright pianos tend to be much lighter and in many cases, even portable. Here we will discuss the best upright piano brands of both types. This upright digital piano is one of the best reviewed digital pianos available at Amazon. Yamaha’s Arius series offers the performance quality of an acoustic upright piano along with the convenience of a digital upright piano. The Yamaha YDP-184 is the latest in Yamaha’s Arius line of digital pianos and is its most advanced model. It features Yamaha’s Pure CF Sound Engine, mimicking the sound of a concert grand piano. The Yamaha Arius YDP-184 also incorporates some of the most innovative sampling technology available today in any upright digital piano. Additionally, the Yamaha Arius YDP-184 uses Graded Hammer Action to simulate the feel of an acoustic piano’s keyboard. Weighted keys are heavier in the low end and lighter in the high end of the keyboard. Its pedals feature Stereo Sustain and Damper Resonance to reproduce the sound of an acoustic piano. More features of the Yamaha Arius YDP-184 include the fact that you can record your performance via the keyboard’s built in recording function. You can also learn many classic piano songs that are pre-loaded into the digital piano, which is accompanied by a songbook. This digital upright piano is not the lightest one available, however. Its weight of 180 lbs. is prohibitive for some users who may wish to be able to freely and easily move their digital piano from one place to another. The Yamaha Arius YDP-184 is available in a beautiful dark rosewood finish or a black walnut finish. Its highly affordable price of almost $2200 incorporates a bundle including the music stand and piano bench. The Casio CGP-700 Digital Grand Piano is a top contender for best overall digital upright piano. It features Casio’s Tri-Sensor Scaled Hammer Action II weighted 88 key keyboard and offers true grand piano sound. Additionally, you can play over 550 effects and other instrument sounds. One of the features that sets the Casio CGP-700 apart from other digital grand pianos is its color touch interface. This is a 5.3 inch color touchscreen from which you can control just about everything on the keyboard. This screen makes the digital piano truly user friendly. In addition to its six-speaker sound system and truly authentic grand piano sound, the CGP-700 also features USB connectivity, as well as USB audio and MIDI recording through a 17-track MIDI recorder. What makes this one of the best overall upright digital pianos is its versatility. The CGP-700 is perfect for many and varied settings – home, class, studio or stage. Keyboard Magazine, Music Inc and the Musical Merchandise Review have all recognized the Casio CGP-700’s excellence. It weighs just over 56 lbs., making it a portable digital upright. You can purchase this digital upright piano for around $800, or in a bundle that includes pedals and bench for $930. 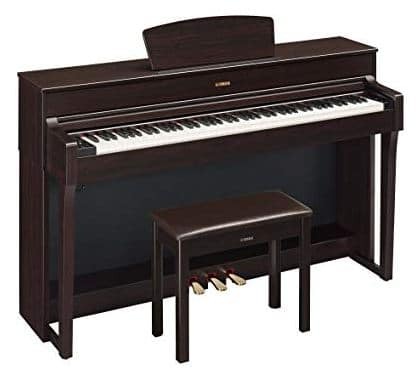 While you can’t find a true upright digital piano under $500, you can find an excellent one just over the $500 price point. For beginners, intermediate players or even more advanced players with a bit less money to spend, the Yamaha P-45 is the way to go. With the sound of a traditional upright acoustic piano, this electronic keyboard/digital piano with 88 fully weighted keys provides superb and unexpected sound quality. The P-45 incorporates Yamaha’s Graded Hammer Action weighted keyboard, with lighter keys in the piano’s higher end and heavier keys in its lower end. It includes a 64- note polyphony as well as a Dual Mode, in which you can combine two voices. The Yamaha P-45 is a great value for a portable digital piano. It weighs less than 65 lbs. and is easy to transport from place to place. Amazon sells the Yamaha P-45 in a bundle including a keyboard stand, bench seat, sustain pedal, polishing cloth, online lesson package, instructional book and DVD for just over $500. For those who have a bit less money to spend on a digital upright piano, the Yamaha DGX-660 is your best bet. This digital piano features a weighted 88 key keyboard and sustain pedal that is designed to replicate the sound and feel of an acoustic piano. This digital piano also has microphone capability, allowing you to sing along while you play, if desired. A headphone jack is also provided. Yamaha’s Pure CF Sound Engine gives the DGX-660 the sound of a concert grand piano, making this digital piano sound and perform even more like a traditional acoustic piano. The digital piano includes a 192- note polyphony with 554 sounds built in, 205 styles and 100 preset songs. The DGX-660 also features Yamaha’s Graded Hammer Action weighted keyboard for a more traditional feel and sound. Additionally, for beginners, the DGX-660 features Yamaha’s Education Suite lesson function. Known as part of Yamaha’s Portable Grand line of digital pianos, the DGX-660 weighs about 70 lbs. (including its stand), making it much easier to move than heavier models. It comes in a white or black finish. The bundle on Amazon includes a piano bench, headphones, dust cover, book, CD, DVD and sustain pedal. It is priced around $850. If you are a student on a tight budget, the Yamaha P-45 is perfect for you. While some may call this model “just a keyboard,” with 88 fully weighted keys, this digital piano perfectly reproduces the sound quality of a traditional acoustic piano. The Yamaha P-45 is fairly lightweight and portable, weighing in at just 64 lbs. It features Yamaha’s Graded Hammer Action weighted keys, lighter in the higher end and heavier in the lower end. A 64- note polyphony is all that a student needs when starting out learning to play piano. Additionally, the P-45 has a Dual Mode, in which you can combine two voices. 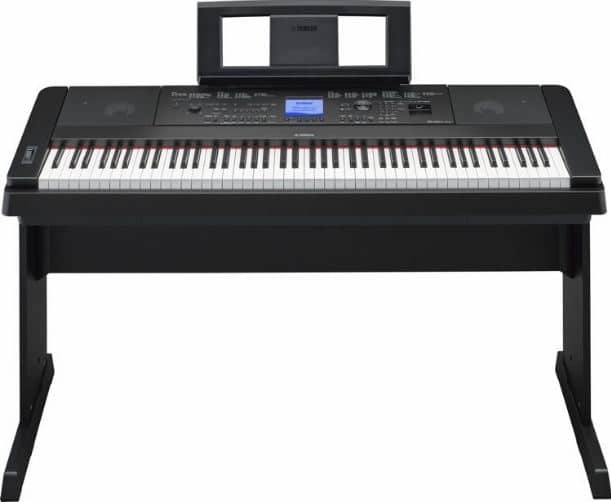 The Yamaha P-45 is available on Amazon in a bundle that includes the digital piano, keyboard stand, piano bench, sustain pedal, polishing cloth, instructional book and DVD, and online lessons for around $520. This is the perfect choice for students or beginners who are just starting out learning to play the piano. Tied for my recommendation for the best digital upright piano for students, the Casio Privia PX-160 is also a strong contender in this category. Its lighter weight (about 25 lbs.) and narrowness (57 inches in width) makes it highly portable, yet it sports a full weighted keyboard of 88 keys (featuring Casio’s Tri-Sensor Scaled Hammer Action II keyboard). Its easy portability makes it perfect for students who must lug their digital piano from one place to the next. This digital upright piano uses Casio’s proprietary AiR Sound Source system, giving it the sound of an acoustic grand piano and incorporating five grand piano voices. Other instrument voices, like organ and strings, are also included. It also contains Damper Resonance, lending the piano a realistic sound and feel when the piano’s damper pedal is used. Casio’s Grand Sound System features an 8w x 8w speaker system that delivers rich sounds from the front and back of the piano. It also has a layering feature, in which you can hear two voices when one key is struck (quite similar to Yamaha’s Dual Mode). The PX-160 is available in black and gold finishes. It is priced around $500, making it easy on a student’s wallet. It is the perfect choice of an upright digital piano if you want to teach yourself to play. Acoustic pianos typically take up much more room than digital pianos. They are heavier and are traditionally thought of as pieces of furniture in a home. Upright acoustic pianos also require more maintenance, including tuning, which digital pianos do not need. Acoustic pianos are usually much more costly than digital pianos. However, some piano connoisseurs only consider acoustic pianos to be true instruments. If you’re looking for a traditional, acoustic upright piano, these are the best acoustic upright pianos currently available new. The Pearl River EU122 is a Professional Upright piano which has been voted number one in acoustic pianos by both PianoWorld.com and PianoBuyer.com. Standing at 48 inches high, it is the perfect acoustic piano for beginners, intermediate players and advanced pianists. One of its premium features is that the highest quality German felt is used for the piano’s hammerheads. Its back posts are off-set to provide a strategic strength in the treble section of the keyboard and less strength/tension in the bass section. Weighing 644 lbs., the Pearl River EU122 is available in a variety of finishes, including Ebony Polish, White Polish, Mahogany Polish, Walnut Polish and Cherry Satin. It is priced around $6700, affordable for many acoustic piano connoisseurs. Additionally, Pearl River offers a 10-year warranty on parts and labor on all of its new upright pianos. The Charles R. Walter 1520 Upright Piano, unlike many higher-end models, is crafted in the U.S.A. Although it stands just 43 inches high, it is known for its unparalleled musical quality. With a soundboard created from Sitka or Bavarian Spruce, and back posts crafted from Sitka Spruce, this upright piano can definitely hold its own among the higher-end brands. Its smaller size (it weighs approximately 400 lbs.) is a plus to many potential buyers who may lack the room required for a larger model upright acoustic piano. At a higher price point such as the 1520 carries, you could expect that a warranty should protect your purchase. Walter offers a 12-year full warranty on all of its new pianos, protecting against any defects in workmanship, materials and parts. The 1520 model is available in a variety of beautiful finishes and styles, including Traditional, French Provincial, Italian Provincial, Queen Anne, Country Classic, and The Riviera. Its starting suggested retail price is $18,000. One of the finest newly constructed upright pianos available, the Schimmel K132 Upright Tradition Piano stands 52 inches high and weighs 580 lbs. It is available in ebony high gloss and mahogany high gloss finishes. The K132 is constructed using Schimmel’s patented Konzert Concept, including a larger soundboard made of wood exclusive to the German company, adjustable gliders, and key tops that are constructed of mineral and ebony wood. Schimmel offers an optional add-on feature of twin tones, which integrates digital piano playing into the acoustic piano experience and offers a feature in which you can play the piano silently. Only a few Schimmel K132s are built each year, so if you want to get your hands on one of these beauties, order early in the year as they are available via special order only. Finishes available include mahogany high gloss and ebony high gloss. The Schimmel K132 is priced starting at $35,000. If you are shopping for an upright acoustic piano and money is no object, I suggest checking out the Steinway & Sons Traditional K-52 Professional Upright. Priced around $44,000, the K-52 carries, of course, the recognition of the Steinway name, but more than that, it carries the Steinway reputation. Each Steinway upright acoustic piano is handcrafted, not mass-produced as with other manufacturers. What makes a Steinway the best upright acoustic piano? For one thing, its keys are made of European spruce and given chip-proof coverings. The key bed is crafted from poplar wood with the ends of the horizontal planks attached to vertical planks made of birch wood. It’s not just the solid wood construction that sets a Steinway apart from other acoustic pianos, however. The soundboard of the K-52 is constructed of Sitka spruce wood and is designed like that of a violin, providing a free, even response throughout the entire keyboard. The upright is not too large for most homes, at a height of 52 inches and weight of 600 lbs. It is available in satin ebony, mahogany and walnut finishes (with the mahogany and walnut priced a bit higher than the satin ebony finish). If you have enough money to afford any acoustic upright piano that you desire, I highly recommend purchasing a Steinway. Whether you’re looking for a portable digital upright piano or a traditional acoustic upright piano, there are many different and highly regarded models from which to choose. 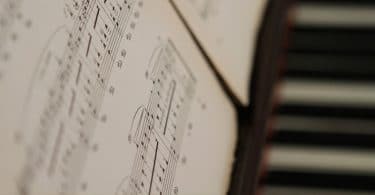 This article features just a small sampling of the many choices that are available within both types of upright piano. Each of the models discussed here have their advantages and disadvantages. 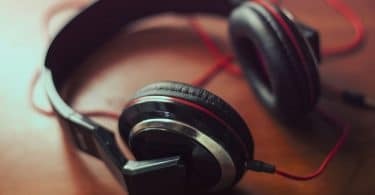 Depending upon how much you’re willing to spend, the purpose of the upright piano, and how heavily used it will be, you can use this buying guide to help you make the decision of which precision instrument you want to buy.